John William and Theresa Helen (Ricke) Vanderheiden are both second from the left. Left to right: Joseph H.and Teresa O'Tool; John William and Theresa Helen Ricke; Henry D. and Ellen Whittle; and Jacob B. The picture was taken at Carroll, Iowa at an unknown date. 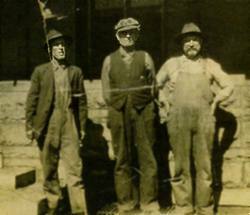 John Vanderheiden (center) with his brothers Jacob (left) and Joseph (right). This picture was taken at the Carroll, Iowa depot.